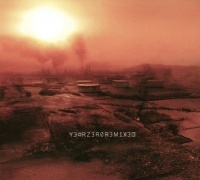 Y34RZ3R0R3M1X3D (pronounced Year Zero Remixed; also known as Halo 25) is a remix album by Nine Inch Nails that is a companion piece to Year Zero. It was leaked to P2P and torrent sites on November 14, 2007, and released in the US as a digital download and a CD/DVD-ROM on November 20, 2007, in the UK on November 26, 2007, and as a 3-disc vinyl set. The album contains remixes from artists that Trent Reznor contacted and asked to do remixes, as well as a fan remix. "My Violent Heart: Pirate Robot Midget" is a fan remix that initially appeared at ninremixes.com, but Reznor was so impressed by it that he asked for permission to add it to Y34RZ3R0R3M1X3D. Multitracks from each track were released and remix.nin.com was launched for sharing of remixes. As of November 20, the album is not available on iTunes UK. The CD is packaged in a six-panel gate fold digipak and contains an insert. As well, it contains a DVD-ROM featuring multitrack files from every track on Year Zero with files formatted for Apple GarageBand, Ableton Live (both PC and Mac), the demo edition of Ableton Live (both PC and Mac), and 16-bit, 44K WAV files for use with any audio-editing program. The vinyl edition is a 3-disc set in a six-panel gatefold jacket with accompanying insert. Olof Dreijer is represented by DEF Ltd. info@d-e-f.com. All tracks (except "Vessel") mastered by Brian Gardner at Bernie Grundman Mastering, Hollywood, CA. "Vessel" mastered by Michael Fossenkemper at Turtle Tone Studio NYC. Art direction and "The Poisoned Sky" by Rob Sheridan. "The Scorched Earth" by Hydraulx. Artist Matthew Santoro. Interscope Records, 2200 Colorado Ave., Santa Monica, CA 90404. Manufactured and distributed in the united states by Universal Music Distribution. © 2007 Interscope Records. All rights reserved. The cover art was posted on NIN.com on August 15, 2007. It should be noted that the cover art for Y34RZ3R0R3M1X3D is similar to the cover art for the Capital G promo. Although there doesn't seem to be anything hidden in the cover art, a closer look at the inner booklet of the CD/DVD shows the phrase "WE DESERVED BETTER THAN THIS", along with "YOUR GOVERNMENT (Illegible)" and "AIR" scrawled on an abandoned house in a polluted wasteland. It is unknown if these are part of the ARG or lead to new websites. Previous release - "Year Zero" Halo number: 25 Next release - "Ghosts I–IV"
This page was last modified on 3 September 2017, at 03:14. This page has been accessed 212,063 times.